Construction is still underway, but as the WedgewoodÂ homeÂ began to take shape it became so irresistible that it sold recently. Itâs no wonder. 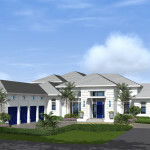 This new model by Hasey Construction has all of todayâs most desirable elements and amenities. âThe Wedgewood is a beautiful home and the largest one that Hasey now has under construction in the Grand Estates,â says Connie McGinnis, Director of Sales. âWith 6,725 square feet under air, this model is a magnificent example of what can be built on the neighborhoodâs generous one-half acre home sites.â The two-story Wedgewood home features four bedrooms, five full baths, two half baths, a family room that opens onto a spacious covered patio, a club room and a wine room that overlooks the living room. There is also a separate office with windows to the swimming pool beyond. Two of the bedrooms, two of the baths and a loft are upstairs, along with a balcony that provides a sweeping view of the 9th hole of Old Palmâs spectacular Raymond Floyd-designed golf course.